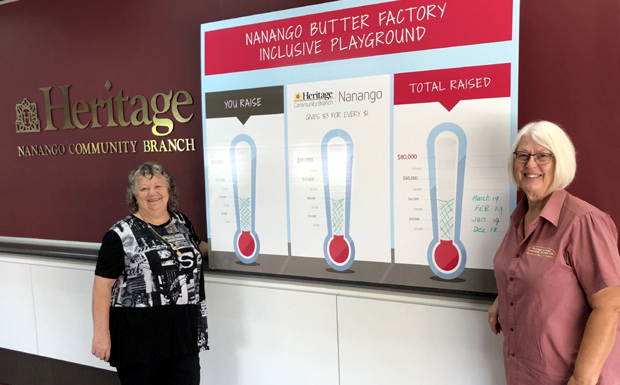 On Friday, a tally board for the Butter Factory Park Inclusive Playground was erected so everyone can view the community’s progress towards the project’s $80,000 goal. The idea of building an inclusive playground for children and adults with disabilities began last May when Nanango mother Cheryl Warner first brought public attention to the problem. Cheryl, who is the parent of a child with disabilities, said the South Burnett’s lack of an all-abilities playground forced parents like her to travel long distances so their children could enjoy the same play experiences that other children can access locally. Her heartfelt plea quickly resonated with the community and within weeks an informal group of local business and community leaders had formed to discuss the issue Cheryl had raised. They quickly identified Butter Factory Park in Drayton Street as an ideal location for the playground, and got permission from the South Burnett Regional Council. After obtaining an estimate of $80,000 to equip the playground, they launched a community fundraising drive in September. The first fundraiser was a Casino Night run by the Nanango Tourism and Development Association (NaTDA), followed soon afterwards by a Halloween Night in October and the region’s first-ever Zombie Walk the next month. In November, Heritage Nanango Community Fund (HNCF) announced it would also support the project, contributing $3 for every $1 the community raised. Since then, community fundraising activities have continued, the most recent being a $2500 donation from the Nanango RSL Sub-Branch. This donation – together with HNCF’s contribution – was enough to push the project to the half-way mark. The new tally board will allow the community to keep an eye on progress as playground supporters press ahead with raising the balance, a task that’s expected to take another four to six months.